Stand a chance to win one of 95 return tickets to select destinations within South Africa to bring a loved one home for Christmas! How to enter: Visit https://wwbringithome.net/ Nominate a close friend, loved one, relative, or yourself for a free return travel ticket to one of the select destinations in South Africa and complete all the other required fields on the entry form before submitting your entry. Only nominations submitted through WWBringItHome.net will be considered an entry. 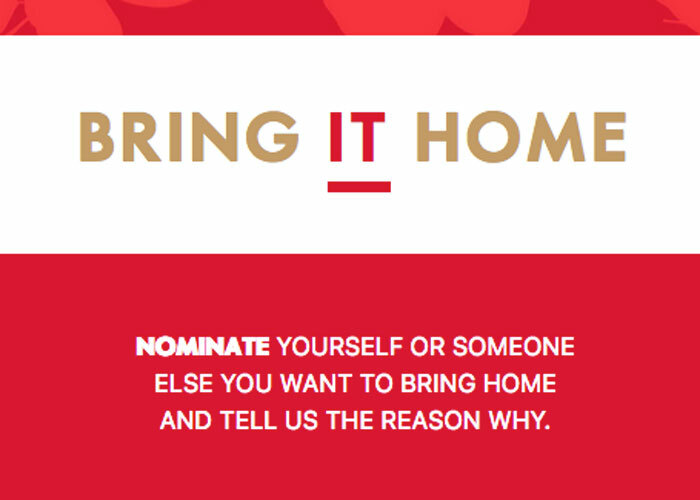 By participating in the #BringItHome competition you agree to accept all the terms and conditions as set out herein. The #BringItHome competition (“the Competition”) is operated by Woolworths (Pty) Ltd (“we/us/our/Woolworths”) and is open to all natural persons over the age of 18 who permanently reside in South Africa (“you/your/participant”). In order to be entered into the Competition, participants must nominate a close friend, loved one, relative, or them-self (“the Nominee”) for a free return travel ticket to 1 (one) of the select destinations in South Africa and complete all the other required fields on the entry form (“the Entry Form”) before submitting your entry via WWBringItHome.net. Only nominations submitted through WWBringItHome.net will be considered an entry. Ensure that the Nominee is available to depart from their nominated place of departure anytime between 15 November 2018 and 25 December 2018 (both dates included). Ensure that the Nominee is available to return from their nominated destination anytime between 25 December 2018 and 31 January 2019 (both dates included). Ensure that the Nominee is an existing WRewards member, or become a member of WRewards before claiming his/her prize. Ensure that, if the participant is determined as a winner herein, the Nominee and/or Legal Guardian, as the case may be, will sign an indemnity form that will indemnify Woolworths and release and hold Woolworths harmless against any and all losses, damages, rights, claims and actions of any kind in connection with this Competition or resulting from the Nominee’s use of the prize, including, without limitation, personal injuries, death, property damage, and loss of property and claims based on defamation or invasion of privacy. The Competition commences on Wednesday, 7 November at 9:00am (CAT) and will close on Sunday, 9 December 2018 at 23:59pm (CAT). The Gift Cards will be awarded within 5 (five) days from the determination of the Winner and thereafter by the 5th day of each following month for the next 5 (five) months. Flights and/or Bus Tickets (hereinafter collectively referred to as “Tickets”) are limited to the selected mode of transport (i.e. flights or bus tickets), routes and travel date options included on the Entry Form and may only be used by the Nominee (i.e. cannot be transferred to another person). Tickets are limited to flights and bus tickets offered by commercial passenger airlines and commercial passenger bus services selected by us at our sole and unfettered discretion. We will in our sole discretion book Tickets on airlines or bus services determined by us and shall not enter into any discussion in this regard. The Prize excludes all items not specifically mentioned in clause 6. For the avoidance of any doubt and without limiting the generality of the foregoing, the Prize excludes any overweight baggage charges, any additional services or products that may be offered by the airline carrier and/or bus services (e.g. meals), any transport to and/or from airports or bus terminals, and any accommodation or spending money. You hereby acknowledge that, should you be a Winner, availability of Tickets can only be confirmed once the booking for such travel is made, which booking will be made within 24 (twenty-four) hours from receiving a copy of the Winner’s or Nominee’s valid identification document as the case may be. Tickets will be limited to, and only be booked for, the mode of transport (i.e. flight or bus) and travel route selected by the Winner on the Winner’s Entry Form. If we, in our sole and unfettered discretion, determine that there are no Tickets available for either one or more travel dates selected by the Winner on his/her Entry Form, we may provide the Winner with alternative travel date options, which the Winner will be required to accept within 2 (two) hours from it being sent, failing which the Prize will be forfeited. You however hereby acknowledge and agree that, where limited seats are available, a quick response may be required and we will not be liable should the suggested alternative travel dates become unavailable during the time when waiting for a response from the Winner. Once Tickets are booked, we shall not be liable to provide/accommodate and changes to such bookings. We shall not be liable for any claim, damage or loss if the Nominee for any reason misses a flight or a bus, or in the event that the Nominee’s Flight, or the bus on which the Nominee’s Bus Ticket is booked, is for any reason delayed or cancelled. Nominees will be required to provide us with all such documentation and/or other information we may require to book and/or make travel arrangements for the Nominee to redeem the Prize herein. If a Nominee fails to provide any such requested documentation and/or information in a timeous manner, the Prize will be forfeited and the Winner and/or Nominee will have no claim against us. Tickets shall further be subject to the standard terms and conditions for carriage as promulgated by the relevant airline and/or bus services on which the Nominee’s travel is booked. In order to redeem the Gift Cards, the Nominee will be required to sign up for Woolworths’ WRewards Programme if the Nominee is not already signed up when the Gift Card is awarded. This card is valid for thirty six (36) months from the date of issue. You may enter the Competition more than once, provided that you include a different Nominee on each entry. For the avoidance of any doubt, you may nominate each person you wish to nominate to win the Prize only once throughout the competition period. You can only win once in terms of this Competition. If you are determined as a Winner once, your entry will be removed from any further draws relating to this Competition. In the event that the Nominee is not able to travel during the proposed travel dates, Woolworths reserves the right to disqualify the Winner from the Competition and select another Winner in his or her stead. We will randomly draw a total of 95 (ninety-five) winners (“Winners”) by means of an automated system from all valid entries received throughout the competition period. Draws will be done at random intervals at our sole discretion within the competition period and a final draw for the balance of the 95 (ninety-five) winners, that were not drawn during the competition period, will be done on Monday, 10 December 2018. The Winner will be selected under the supervision of independent auditor. We will notify each Winner by contacting the Winner on the telephone number included on the Winner’s Entry Form within 2 (two) days from determination of the Winner. If a Winner is not contactable after we have made at least 2 (two) attempts to contact the Winner, that Winner will forfeit the Prize and we will have the right to select a different Winner on the same conditions. Each Winner will be required to provide an electronic copy of his/her identification document within 24 (twenty-four) hours from being requested by us, failing which the Winner will forfeit the Prize and have no claim against us. We may announce the Winners on our social media platforms, website and/or on the Expresso television show on SABC 3. The Competition shall not be open to directors, members, partners, employees, agents or consultants of Woolworths (Pty) Ltd, Woolworths Financial Services (Pty) Ltd, Country Road Ventures (Pty) Ltd, Virtual Market Place (Pty) Ltd and any of their holding, subsidiary or associated companies, their marketing service providers in respect of this Competition, and the direct family members of such directors, members, partners, employees, agents or consultants. Woolworths collects and uses personal information about participants to allow them to enter the Competition, comply with audit requirements in terms of the Consumer Protection Act and to determine the Winners for the Competition. Woolworths may use Winner’s name and/or images in marketing material but winners will always be informed of this beforehand and will be given an opportunity to refuse to permit any use of their names and/or images. For more about our how we use your personal information please read our privacy notice. By entering this Competition, you specifically and expressly consent to us processing your personal information for these purposes and you specifically and expressly consent to us contacting you for marketing purposes. By participating in the Competition, you agree to indemnify Woolworths and release and hold Woolworths harmless against any and all losses, damages, rights, claims and actions of any kind in connection with this Competition or resulting from acceptance and participation in the Competition and/or the use of the Prize by the Nominee (whether arising from negligence or otherwise) including, without limitation, personal injuries, death, and property damage and claims based on defamation or invasion of privacy. Nothing in these terms and conditions is intended to, or must be understood to, unlawfully restrict, limit or avoid any rights or obligations, as the case may be, created for either the participants or Woolworths in terms of the Consumer Protection Act, 68 of 2008. If required by the Minister of Trade and Industry, the National Consumer Commission or for whatever other reason, we will have the right to modify or terminate this Competition with immediate effect and without notice of such modification or termination. In such event, all participants hereby waive any rights, which they may have against us and hereby acknowledge that they will have no recourse or claim of any nature whatsoever against us. The Competition is in no way sponsored, endorsed or administered by Facebook, Instagram and/or Twitter and any correspondence related to the Competition should be directed at us and not Facebook, Instagram and/or Twitter. Any reference to Woolworths in these terms and conditions shall be deemed to include a reference to Woolworths (Pty) Ltd and Woolworths Financial Services (Pty) Ltd and any of their holdings, associated, affiliated companies and subsidiaries. We reserve the right to amend these terms and conditions at any time during the competition period, should it be deemed necessary in our sole and unfettered discretion.